Sign Up for Alerts now! Display the upcoming dates and times for Asnaes, Denmark. Visit the widget page to learn more and for additional options. Copy and paste the code wherever you want the widget to appear on your website. - Required fields are marked with an asterisk. - Email and Confirm Email addresses must match. - Mobile and Confirm Mobile numbers must match. - SMS and Confirm SMS addresses must match. - The email address / mobile number you entered is not valid. Do you want email or mobile text alerts? * Who is your mobile carrier? *NASA is not responsible for any fees that may apply to your accounts registered for this service. Check your mobile carrier's website to learn more about their fees and email-to-sms support. * I verify this email account / phone number is mine and I have the right to register for this service. * I understand the National Aeronautics and Space Administration (NASA) is not responsible for any fees that may apply to site users by their wireless carrier or internet provider. What am I looking for in the sky? The space station looks like an airplane or a very bright star moving across the sky, except it doesn’t have flashing lights or change direction. It will also be moving considerably faster than a typical airplane (airplanes generally fly at about 600 miles per hour; the space station flies at 17,500 miles per hour). 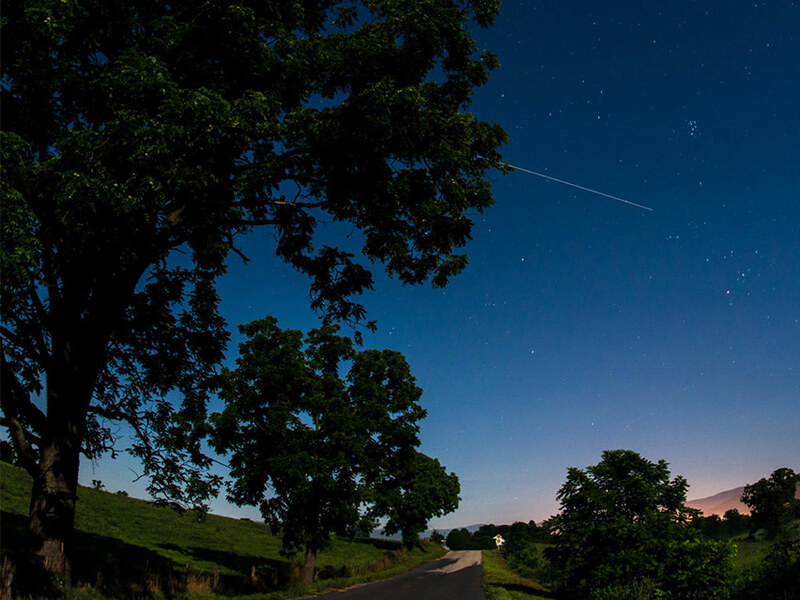 Below is a time-lapse photo of the space station moving across the sky. How do I Spot The Station? What does all this sighting information mean? Time is when the sighting opportunity will begin in your local time zone. All sightings will occur within a few hours before or after sunrise or sunset. This is the optimum viewing period as the sun reflects off the space station and contrasts against the darker sky. 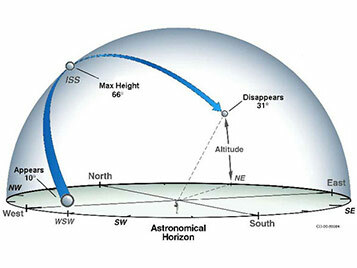 Visible is the maximum time period the space station is visible before crossing back below the horizon. Max Height is measured in degrees (also known as elevation). It represents the height of the space station from the horizon in the night sky. The horizon is at zero degrees, and directly overhead is ninety degrees. If you hold your fist at arm’s length and place your fist resting on the horizon, the top will be about 10 degrees. Appears is the location in the sky where the station will be visible first. This value, like maximum height, also is measured in degrees from the horizon. The letters represent compass directions -- N is north, WNW is west by northwest, and so on. Disappears represents where in the night sky the International Space Station will leave your field of view.